With ever increasing pressure from southern white settlers to increase the size of their cotton kingdoms, President Andrew Jackson readily signed the Indian Removal Act in 1830. The act ultimately led to the deportation of native peoples in the Southeast U.S. to Indian Territory west of the Mississippi River. The 1832 Treaty of Cusseta ceded all Muscogee land claims in Georgia and Alabama. 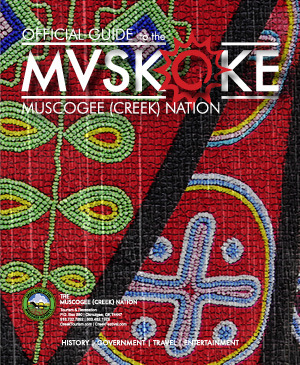 With no more ancestral homelands remaining in their grasp, the Muscogee people that remained were forced into stockades at Ft. Mitchell, Alabama to await their westward journey. The people of Locv Pokv arrived in Indian Territory in 1836. In a ceremony proclaiming their arrival and establishing their new home, they placed the ashes from their original fires at the base of a towering oak. At this place, on a hill overlooking the Arkansas River, they brought to life a new fire. The site, referred to as Tulsa’s first city hall and now known as the Muscogee (Creek) Nation Council Oak Park, was listed in the National Register of Historic Places in 1992. Vendors should set up at the Tulsa Indian Community.